A performance review/evaluation (Measurement / Appraisal) is a process of assessing an individual based upon their job performance, productivity and non job related activities occurring in the office. Performance and productivity reviews may include standard metric reviews, call quality including recorded call performance and quality scores, product and service knowledge, sales/sales upgrades/ subscriber extensions, achievements, customer service, training and training results, attendance, non work related activity and attitude. Depending on the industry and the organization goals more topics can be added to the overall list of performance review items. Performance reviews are timely and require a significant predetermined process to create an outcome that is relevant, accurate and worthy of personal discussions with agents and supervisors. Because of the workload to do a full and complete review many are not given or some that are provide a lack of relevant data. Reviews are often delayed because of overload and stress the manager is under. Agent level feedback also delays the reviews because the review of the past were poorly conducted too lengthy and not relevant to the goals the agent was targeted to achieve. Also if agent turnover is high what is the incentive to the manager to review agents that will be leaving the company? While this sounds negative it is an example of what is going on at many contact centers. What some contact centers have begun to do is to narrow down the reviews and make them more relevant to longer term agents. New agents are not getting full reviews until they meet and exceed predetermined goals that have been discussed in training. Targets and goals for the top key metrics: The organization will have goals and targets for the agents to achieve regarding key metrics. These metrics will vary by industry, they will vary by the groups within the contact center as a simple example the metrics will vary by the agent experience and skill sets and they will vary by month, week, day and time of day. To determine how the agent has actually performed the manager sets the goal for a metric, then divides that by actual performance for that metric in question. For example, the agent has a goal of 90% for adherence. The agent’s actual performance was 65% or 25% below the goal. Therefore, the agent has performed well below the goal. Yet the agent argues that he was under pressure for other goals. This same agent claims that he is unable to meet his schedule because he puts at risk FCR and Customer Satisfaction goals. He is under pressure to resolve all customer issues with the first call. He is also trained to satisfy the customer regardless of the time it takes to resolve the problem. These two additional goals make it difficult at time to stay on schedule for training, breaks, coaching and logging out and into outbound calls. Metrics levels change through the year: Throughout the year metrics change based on the industry the contact center is involved in. December to some agents is a very busy time while January is slow for those same agents. So looking at agent performance should be done on a monthly basis and not just an annual basis because of the annual averaging of the performance outcome. Monthly reporting is done through analytics similar to figure . 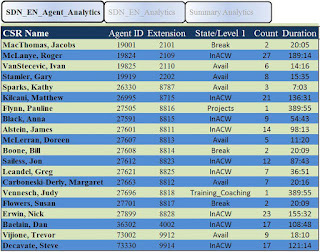 Figure shows this group of agents has performed for the day. Taking the monthly analytics and summarizing the data for the year explains how the agent has underperformed in certain key metric areas. Creating an annual review of key metrics and showing the actual annual time spent in or out of those metrics can be a key towards successful performance reviews. 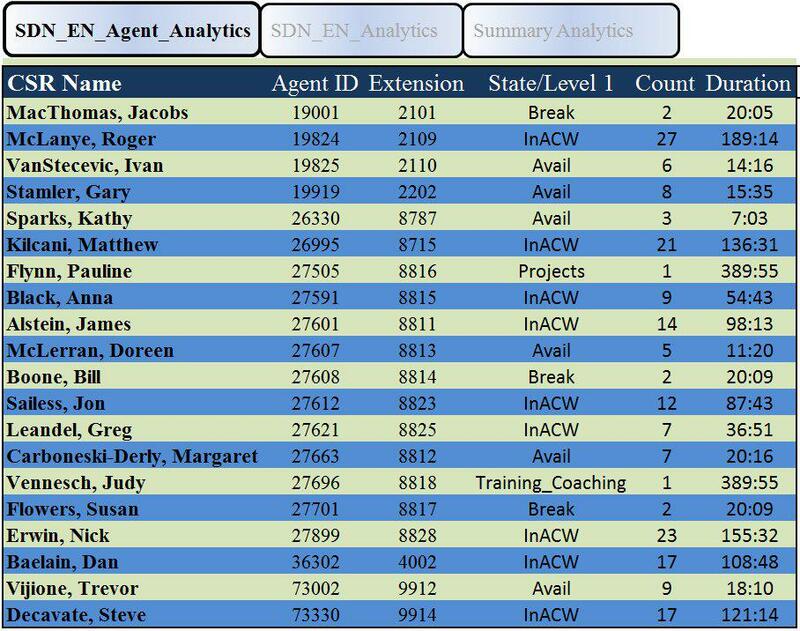 This annual agent status review (agent name and state / level changed to protect confidentiality) shows that Jacobs spends a lot of time on the call wrap up. Training for the year was 5 days. Is it possible to improve after call wrap up by additional training? By adding a scorecard for the agent for the annual review the manager can discuss the importance of certain key metrics and how the agent has performed. Scorecards will depend on the industry and the group the agent is participating within. The scorecard will also be affected by the agents experience and skill sets. Scorecards, like analytics are affected by the risk factors. While these are not always 100% accurate they are very helpful in the general discussions with the agent and supervisor. There are many factors to consider prior to annual performance reviews. Some factors are not even mentioned in this article. In one HR situation the Contact Center manager had a good relationship with an agent that had a positive attitude and was always fun to be around. However, this same agent did not meet most of her key metrics and adherence and occupancy goals were rarely met. Her response was she was helping other agents personally. What is your turnover in the contact center? How much does that cost you? Is having agents that do not perform and do not meet goals a cause of concern or are you more concerned about the replacement process? Annual performance reviews are challenging work but should be done. Spectrum is a leading provider of Unified Contact Center Reporting. Contact Spectrum today to learn more about Analytics and Scorecards.